“My roots were deeply embedded in the Lutheran tradition, growing up in a clergy family and then offering my music gifts in worship leadership in my adult years. A two-year volunteer program with Lutheran Missions overseas as a teacher in Papua New Guinea during my twenties led to a global perspective and a deeper appreciation of Canada’s place in the world. 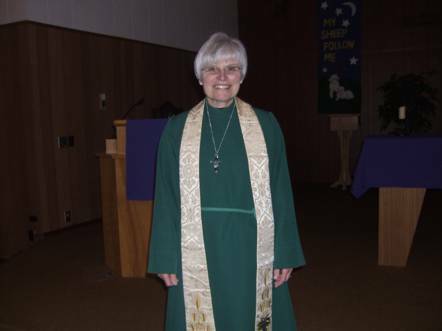 When I returned, I began theological studies at the Lutheran Seminary in the late 70s and then decided to return to teaching where I remained for thirty-some years. My area of teaching combined two specialties – Music and French. Both called forth creative and energetic leadership. In time, I embraced my spiritual home in the United Church. In recent years, the call to return to theological studies led to discernment and then the Diaconal Program at the Centre for Christian Studies. To do this, I “retired” from teaching and have been working in part-time ministry (Northern Lights Presbytery) and full-time CCS studies. I would describe my leadership within the church as diaconal – not so much in the actual task of ministry, but in my way of doing ministry. In rural and smaller urban churches this most often calls forth ‘all things needed’ as I embrace my joy and commitment to Word and Sacraments, Pastoral care, Christian Education and Community Outreach. I see the call of ministry as an invitation focused on strong vital team building and empowering one another to offer their gifts as service to and for others. I lift up the personal and communal call to seek justice and invite all to embrace acts of kindness for the sake of the well being of all. Rooted in spiritual practice, in the love of sacred scripture and liturgy, energized by theological conversation and attentive to creative ways the Spirit speaks in our lives today, I offer my gifts so that together we can move forward as the people of God in life-giving ways as we seek together to live faithfully in today’s world.